Last Sunday’s baking was some brioche-crusted peach tarts. Just as the first one was ready to go into the oven, the early morning sun came streaming in through my dining room window. I thought the streaks of light falling across the yellow fruit on yellow dough evoked the hopeful theme of Click! Yellow for Bri. This month, the photo event hosted by Jugalbandi supports a fundraiser for Brianna Brownlow (Figs With Bri). Please go read about it and donate now if you haven’t already. The tart will be here when you get back. 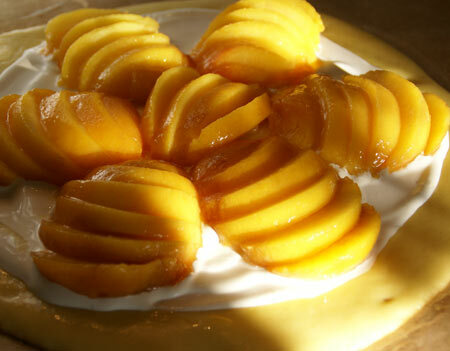 The tart is very simple in construction: a disc of brioche dough spread with a thin layer of crème fraîche and topped with sliced fresh peaches. This is a great way to eat brioche because, as a crust, a little goes a long way. Although the butter content of the dough is quite high, the tart overall is not what I would call very rich, nor is it terribly sweet. The tart can be adapted in many ways. Other fruits could be used; I have made one with pears, and I think cherries would also be delicious. 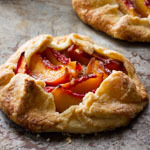 I like the way the tartness of the unsweetened crème fraîche compliments the brioche and peaches, but you could use pastry cream or other filling if you’re after something a bit sweeter, or to add another flavor into the mix. Please leave your ideas in the comments! 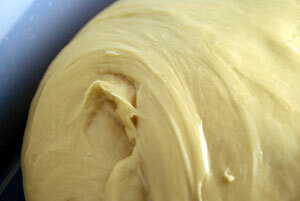 The mixing of brioche dough is similar to that of panettone and other sweet rich doughs. Because both sugar and butter interfere with gluten development, the key is to add the sugar very slowly, and the butter only after the gluten has been fully developed. The brioche recipe, which is adapted from one I learned at SFBI, calls for osmotolerant instant yeast (SAF Gold). This yeast performs well in a high-sugar, low-water dough. Normally, sugar interferes with fermentation of the dough because it pulls water away from the yeast, slowing down its metabolism. If you don’t have osmotolerant yeast, use regular instant. The dough recipe makes enough dough for two tarts, or one tart plus about six small brioches à tête (the shaping of which, as you can see, I’m not very good at and I will leave as “an exercise for the reader”). Place the dough on a parchment-lined baking sheet. Brush the disc lightly and evenly with egg. Meanwhile, blanch, peel, and halve the peaches. Brush them with lemon juice. Also meanwhile, center a baking rack in the oven and preheat it to 380F. Brush the outermost inch of the proofed dough (still on the parchment-lined baking sheet) lightly with egg. 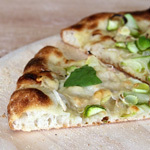 Spread the crème fraîche evenly over the dough, stopping one inch from the edge. 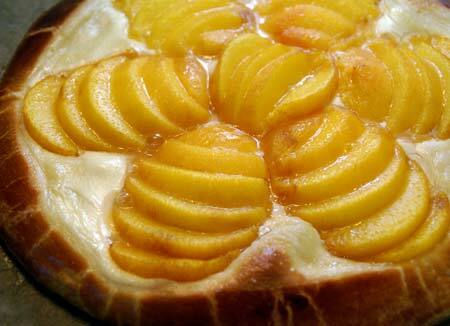 Slice the peaches and arrange them on top of the crème fraîche. 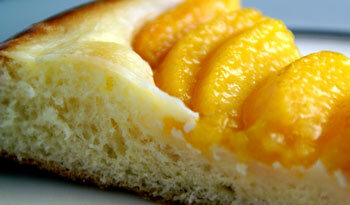 (For the tart above, each “petal” is one half peach, sliced straight-up-and-down. They can also be sliced in wedges, as I did for the tart below.) Brush the peaches lightly with lemon juice. Bake the tart for 15 – 20 minutes, until the crust is a shiny, deep golden brown. Keeping it on the parchment, transfer the tart to a wire rack to cool. Place flour, milk, eggs, salt, and yeast in the bowl of a stand mixer. Mix at low speed for about 4 minutes. It is normal for the dough to be quite stiff at this point. Continue to mix in medium speed until the gluten reaches full development, i.e., you can stretch a paper thin, translucent “windowpane” from the dough. Transfer the dough to a covered container and ferment at warm room temperature (about 76F) for one hour. Space the preshaped dough on a baking sheet and slip the sheet into a plastic bag or cover with plastic wrap. 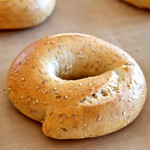 Refrigerate overnight (8 – 12 hours). The dough is now ready to be shaped, proofed, and baked. that looks mystical – and beautiful. Oh my gosh, Susan what a lovely dessert. I’m in awe of it. 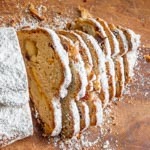 We have a similar dessert in my region called “fougasse” but sweet. It is a brioche type dough, but less eggy, and topped with crème patissière and often fresh fruit. It is sooooo good and I make it sometimes. Peach season soon will be here (I’m in a producing area, yay!) and I’ll definitely give your version a try. Very nice initiative for Bri by the way. I truly believe in alternative treatments when possible. This tart looks absolutely amazing! I bet it tasted fantastic! Thanks for the info about osmotolerance and yeast. I’ve always wondered what SAF Gold was good for. What do you mean you’re not good at shaping brioches a tete?! I saw the picture and immediately decided to ask you for tips, mine are always much more skewed! love the look of this tart. 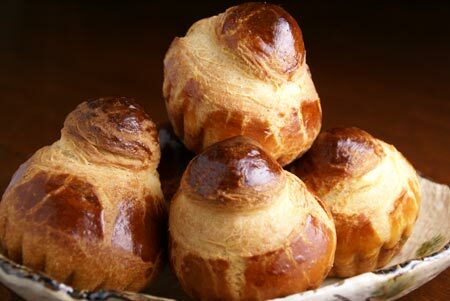 Brioche and a dessert…how could you go wrong! The simplicity of this dish is amazing! I love the idea of a brioche crust! Just beautiful! Thank you so much for sharing! bee, thank you. It is a wonderful thing you are doing for Bri. Jane, I always think of fougasse as a savory bread but when I hosted BBD a couple of months ago there was a sweet Italian version of fugassa (focaccia). What region of France are you in? Do you have savory fougasse also? Eileen, it tasted really good to me, but it wouldn’t be the cup of tea for anyone whose taste runs to very sweet desserts. Jude, one of these days I’m going to do a head-to-head trial of SAF Red vs. God in a sweet dough to see how much difference the Gold really makes. Last year when I made panettone I forgot and used Red for some of it and it wasn’t a disaster. Astrid, if you can make brioche this tart is a piece of cake, so to speak. Really really simple once you have the dough. And I’m just good at positioning my têtes so you can’t see how askew they are. Sweet & Saucy, my sentiments exactly! Joy, thank you. I think the simplicity is what I like most about it. I always go back to your site, even after I found other sites. You are great! Brioche Tart… yum. I was wondering though what other fruits are good. Strawberries? Blueberries? Apples? Do we need to sautee apples first? What do you think? What a lovely dessert. Brioche is great but this is fantastic. Great light in that picture – looks totally delish! Jane, when I’ve seen fougasses, it’s always been a savoury yeast flat bread cut into a leaf pattern. I didn’t know there was a fougasse dessert. What culinary region are you from? Great presentation! Beautiful tart. 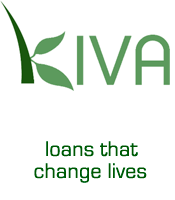 Worth trying – bookmarking it. foxy, you’ll love making the brioche, I think! Erina, I’ve only done it with pears and peaches but I think any of the fruits you mention would be good. I think lightly sauteeing the apples to soften them just a bit would be good. Dana, I love morning light. Just one reason I like getting up early. farida, thank you! Hope you like it. I’m in “Catalogne” near Perpignan (the Méditerranean Sea), by the Spanish border. Yes, there are many savory fougasse as well. I think it is basically a Méd Sea thing. I’ve never even made a savory one, yet! Great idea your yeast spotting. Especially for someone like me who doesn’t have the time to look around at all the different blogs. Thanks! What a gorgeous looking tart! It is bright and sunny and just sings of summer. I also love the idea of using a brioche crust/base. Thank you so much for this terrific recipe and the instructions! My parents came for a visit and this was a nice surprise for them after a long drive. They really liked it – and they are very hard to please. I was a bit unsure about the consistancy of the dough after taking it out of the fridge – but the tart and the “Brioches” (I used my muffin pan since I don’t own Brioche forms) came out great and tasted even better! 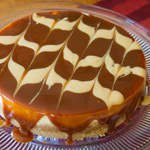 Thanks again for the great recipes – every one I tried so far turned out great. Pietro, I suppose if I were to try this without a mixer (which I don’t plan to any time soon) I would still follow the same steps for adding the ingredients, just mixing well by hand. Of course brioche was made before there were electric mixers. The bakers did, however, have apprentices who worked for next to nothing and could not complain about anything. This reminds me of these fruit bagel pizzas I used to find at the Bagelry in CA. They had a pastry cream on a rich, sweet bagel dough with cherries, peaches, or blueberries. 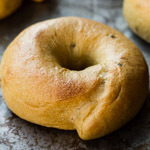 Brioche dough is much lighter and not chewy like bagel dough, so I’d bet it tastes even better. I am wondering, though, if I could use pastry cream instead. I’m not sure how I would like the creme fraiche on this. I think I’d like something a bit more custardy. Lissa, you could absolutely use pastry cream. Frangipane would be nice too. susan, I always make brioche but didnt know that about butter and gluten! we learn something new everyday..
now I understand why sometimes it tooked soooo long to rise. I am thinking on making it with mangos instead of peaches, as here where I live there are no peaches, only tropical fruits. 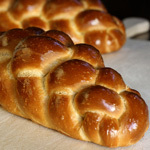 I just finished making this brioche, and have to tell you, best brioche ever!! I didnt wait the 8hs, just a couple of hours. 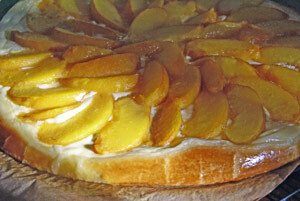 used frangipane instead of creme fraiche, and mangos wiith some pineapple. What would you recommend substituting for creme fraiche if we can’t find that in the store? I saw someone mentioned frangipane or pastry cream, but would sour cream work? 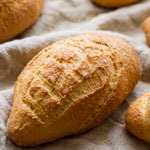 Do I use all purpose flour or bread flour?